The essential item for this Spring/Summer/Fall is....the jacket friendly custom denim shirt, $185. We all know a denim shirt can be paired with colored jeans, pants, or shorts, but dare to wear it with a suit or sport coat and you will be on the edge of fashion. Choose custom for your denim shirt so that we can make it with a jacket friendly stiff collar, left mid-section monogram, and have it custom fit to your body. Order now in time for Spring and we'll throw in that snazzy lapel pin button pictured above - while supplies last. The Must Have Summer Suit...Wool & Linen. Breathes like linen but drapes like wool. This three piece wool & linen custom suit is perfect for summer since it breathes like linen but drapes like wool. It has slim peak lapels, contrast color functional buttonholes and a flat front pant with side tabs - no belt required. $1245 in a three piece suit. It's a must have for Summer events and weddings (your's or someone else's!). The Perfect Derby Look...and don't be afraid to roll up your seersucker sleeves after your horse comes in! This custom seersucker suit is in classic blue, has functional cuff buttonholes in white, a white paisley lining, and has self-fabric elbow patches turned 90 degrees. $995 in a two piece custom suit, choose from 10 seersucker pinstripe colors. Summer Suits need to be fun. Add a Peak Lapel, Ticket Pocket, Contrast Functional Buttonholes, and a Fancy Lining. Bow Tie and Patch Pockets Anyone? Grab Attention with this Custom Look. 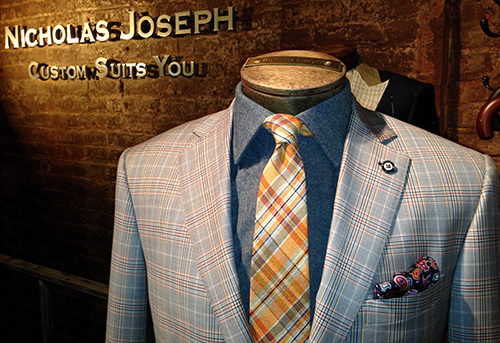 Get the look: A Custom Peak Lapel Summer Suit and the Ever-So-In Plaid Tie. Custom Super 120s light grey peak lapel two piece suit, $995. Custom Egyptian Cotton shirt with semispread collar, $185. Silk and wool plaid tie, $90. A fantastic look for the office or weddings this Spring and Summer. For the 'not so saucy St. Patty's Day soirée. A custom emerald green velvet shawl lapel dinner jacket. The perfect patch pocket blazer, for jeans or trousers.